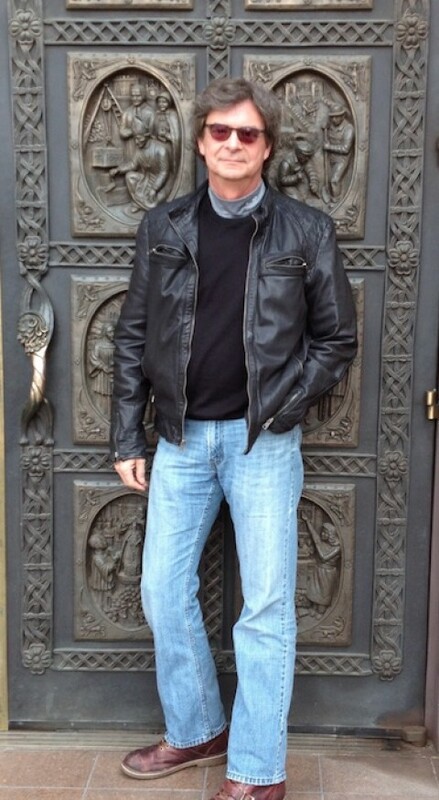 James Anderson grew up in the Pacific Northwest and completed an undergraduate degree in American Studies at Reed College and a Masters Degree in Creative Writing at Pine Manor College in Boston. In 1974, while still an undergraduate, he founded Breitenbush Books, whose authors included Mary Barnard, Bruce Berger, Clyde Rice, Naomi Shihab Nye, Michael Simms, William Greenway, John Stoltenberg, Sam Hamill, and Gary Miranda. Anderson served as Breitenbush’s publisher and executive editor through 1991. His poems, short fiction, essays, reviews and interviews have appeared in Northwest Review, New Letters, The Bloomsbury Review, Solstice Magazine and elsewhere. From 1995 to 2002, Anderson co-produced documentary films, including Tara’s Daughters, which chronicled the plight of Tibetan women refugees as carriers of Tibetan culture in the diaspora. The film won Best Documentary at the New York Film Festival. EB: How did you come up with the idea for The Never-Open Desert Diner? JA: I recently wrote a piece on process where I suggested that there were essentially two kinds of novelists: architects and gardeners. When we create, in whatever medium or genre, I believe the impulse can be broken down to either exploring (gardeners) or building (architects.) Both processes produce great novels, but I am firmly in the gardening category—yes, I am answering your question—which, for me, means I walk out into the field and start planting, then cultivate and harvest whatever pops up. Sometimes some very strange and wonderful plants begin to grow. The seeds might be a snip of dialogue, a location, a description or, most often in my case, a central image, however indistinct, that carries within it an emotion, or several. In this sense I do not actually begin with the idea of a story. 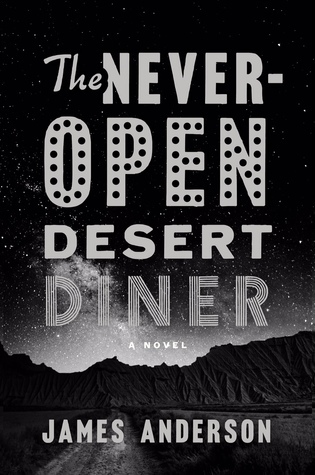 My novel The Never-Open Desert Diner began with simply imagining a two-thousand foot granite mesa cliff swirling in that beautiful red light of the Utah desert. That was how I began the writing. The novel itself ends with that description. I just plant, water and watch through the process of composing the rough draft; and then, when I have the crop in front of me, and I know what the story is—that is, the story that has been revealed to me—I revise and revise what originally sprouted in situ. JA: Well, I was born in Seattle and raised primarily in verdancy of the Willamette Valley, but also on the Oregon coast and a little in Northern California. Most people, even Oregonians, tend to think of Oregon as predominately represented by the Willamette Valley and the coast, when in fact two-thirds of Oregon is the high desert that I love—Bend, Burns, Fossil, Baker City, Dufur, Crane Prairie and so on. The novel could have easily been set in the arid high desert region of southeastern Oregon if high desert was all there was to the setting, except there isn’t the unique quality of the red-tinged Utah light of which my friends and literary heroes Terry Tempest Williams and Bruce Berger write so eloquently. I know that region and how the light suffuses the soul and body there in ways that are magical and terrifying and bathe human time in geological time and rhythms and a kind of spirituality borne of the natural world. Glancing ahead to your fine questions, I see we will touch upon paradox, and for now all I will is say that my novel and the story, and the characters, are very much entwined with paradox, contradictions, living oxymorons. EB: Ben Jones was an engaging character—a kind of forgotten man who maintains his dignity in the face of adversity. I found myself liking him even though we had little in common. You seemed to build his character through a series of small decisions her makes. JA: Thank you. Dashiell Hammett said that we are not measured by how we deal with success but how we handle adversity. Who a person is at his or her core is not revealed by one grand action, good or bad, but on everyday actions that indicate a pattern. Ben is struggling, as we all do. He makes poor decisions sometimes. Yet he is always trying. This struggle is illuminated through the person point of view, which includes internal monologues of that struggle. As I was shaping Ben Jones as a character I wanted him to be average, not some kind of super hero, or someone with special skills. For me, and this has always been true, the people I admire most are the ones who get up every damn day and do the best they can, often against incredible odds, no parades, no medals of commendation. When my novel was being rejected I was often asked, from thriller and mystery editors and agents, “What’s your protagonist’s super power?” I knew what they were asking and I knew my answer wasn’t going to excite them. Ben Jones is not a former Navy Seal, nor does he have friends in powerful places. His super power is he gets up and does a job for a low wage that few appreciate and he tries to do the right thing—and occasionally fails—and gets up the next day and does it again as well as he can do it. That’s my idea of a hero. It was immensely gratifying that so many readers and reviewers thought so too. EB: The title is filled with contradiction—a never open dinner. How did you choose that? JA: Ah, yes, the title—my original title was DESERT CELLO. My publisher didn’t like it, and a number of friends thought it didn’t communicate enough about the story. One of them, my friend and literary agent (not mine) Ann Rittenberg, told me I should change the title. She’s as smart and perceptive a book publishing veteran as one is likely to find. Ann represents James W. Hall , Dennis Lehane and C.J. Box , to name just a few. She told me to read my first chapter and ask myself what image or phrase comes to mind. In the first chapter the diner, which is really named The Well-Known Desert Diner, is nick-named The Never-Open Desert Diner by locals. Its owner, Walt Butterfield, and his diner, are central to everything in the story. I suggested the title to Ann and she immediately said, “I love it!” I then polled a number of friends, many of whom are writers, and the consensus was that it was a good title. I am of the opinion that the title of a novel is the true first line of the novel; it is the first thing the reader sees. The best titles ask questions, or create questions in the readers mind, if only implied, and should deepen and change throughout the reading of the novel. The title I chose, in my opinion, does exactly that. It conjures the archetypal image of a diner in the desert, provides the setting and sense of place, and asks, “Why is the diner never open?” My title (besides the fact that I love its rather whimsical and lyrical phrasing) does all a good title should do and in the process compels the reader forward. EB: The supporting characters seemed paradoxical too. How did they arise? JA: This is a great question, and I am glad to respond, because perhaps this is a quality that appealed to readers. The entire novel is slightly subversive and it achieves this through contradiction and paradox and provides much of the dramatic and comedic tension. When I use the word ‘subversive’ I do not mean it strictly in the sense of undermining a government, but undermining tradition, even genre, by intentionally mining opposites, though in the rough draft this was not consciously done but in subsequent drafts I worked to emphasize it. We have an old itinerant preacher who hauls a life-sized wooden cross up and down an isolates desert highway; a very smart and self-reliant homeless, single, punk pregnant teenager who becomes the heroine of the novel; a diner that is perfectly maintained and yet is never open; a truck driver who has no tattoos, and in a way meditates on and celebrates the natural world; a cello that has no strings and whose music is never actually heard yet provides an imaginary soundtrack to the novel. I cannot tell you how the characters were invented. Ginny, the homeless, punk pregnant teenager started out as just a nightshift clerk in a Walmart and slowly grew to a greater presence in the novel. I like the idea of going against type, against preconception, and in the case of Ginny, since every detective (though Ben is not really a genre detective) there is a kind of sidekick, Gal Friday, who is a pragmatic femme fatal. I turned that on its head by making that person a pregnant, punk teenager. I made Ben Jones, the protagonist truck driver, the ultimate exile orphan, a Jewish Native American. Ben doesn’t know for sure. He was abandoned as a baby on the Warm Springs Reservation in Oregon and was thought to be the baby of a Jewish social worker and a Native American man and as a young boy, Ben was adopted by an older, childless Mormon couple in Utah. JA: The Never-Open Desert Diner is the first of a trilogy, though I prefer to think of it as a triptych, more of a panorama in sections, though related, each is also a stand alone work. The second, Lullaby Road, is at Crown Publishing Group now and should be out in early 2018. Right now I am working on a memoir about being raised by a single, divorced mother in the 1950s—back when America was “Great.” (Insert sardonic smile here.) Also a collection of stories and novellas. EB: Who are some writers you read? Or who have influenced you? JA: That’s a long list. Early on, of course, Mark Twain, William Carlos Williams, Conrad Aiken. Sounds uninspired but nonetheless, true. I read books in every discipline and I firmly believe that a writer’s wellspring should draw from diverse sources of inspiration. In contemporary American fiction I am consistently blown away by Michael Chabon , Luis Alberto Urrea and Sherman Alexie. I read a lot of nonfiction, memoirs and biographies, history, geology and natural history, with an emphasis on environmental studies, but particularly physics and neurobiology. Most recently the work of Steven Pinker and Murray Gel-mann and Gary Zukav’s The Dancing Wu Li Masters. For the past few years I have been especially drawn to the concept of Entanglement Theory for its far-reaching implications in every aspect of human existence. Of course, I also read a lot of philosophy, particularly Zen Buddhist, both popular and scholarly, among them (returning again and again) are the works of Shunyru Suzuki’s Zen Mind, Beginner’s Mind, D.T. Suzuki, and one of my particular, and these days somewhat obscure favorites, is Nishida Kitaro. I also read a lot of contemporary poetry (too many to mention) and, for lack of a better word, popular fiction, including C.J. Box and Cormac McCarthy. Then there are the works I read in translation. I am a huge fan of Enrique Vila-Matas, Laura Restrepo, and the late Umberto Eco. Everything I read informs my work in one way or another. In terms of The Never-Open Desert Diner, particularly the works of Bruce Berger and Terry Tempest Williams (who I mentioned earlier) plus, James Crumley, John D. Macdonald and Thomas Merton, especially his translation of the 2nd Century desert ascetics published as Wisdom of the Desert. EB: Any advice for aspiring fiction writers? JA: Sit down. Shut-up. Read. Write. Write. Write. Learn all you can all the time from everyone and everything.. And damn it, have fun! And write. Ed and James, this interview strikes me as one of the best literary conversations I have read. Provocative questions, resonant answers — although surely made before in other words, other places — feel fresh and organic as hell. I especially keyed in how James writes (gardens) and what (other writers, other genres, Nature) shapes him and his harvest. I go now to feast on some of that harvest. Must confess that I, too, have an appetite for the output of people and places James references.